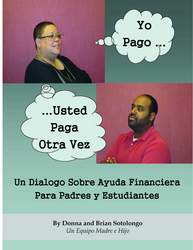 Student Funding Group, LLC (StuFund) announced the production of its new eBook in Spanish "Yo Pago, Usted Paga Otra Vez". Written by mother-son team Donna and Brian Sotolongo, this book provides a cross-generational dialogue about financial aid. These experts focus on giving parents and students the information needed to secure grants and loans while minimizing debt. The Spanish translation of this ebook is critical to reaching a broader segment of our customers. This is incredibly important. “The Spanish translation of this ebook is critical to reaching a broader segment of our customers. This is incredibly important.” said Sergio Sotolongo, StuFund Chairman and CEO. Crucial financial aid information is needed by both students and parents in order to make informed decisions when it comes to paying for college. Each generation wants different types of information. This eBook is written with this in mind. This eBook is designed for both parents and their children to simplify the financial aid process. Copies of the books can be purchased on the StuFund Knowledge Center website. There will be a limited number of printed copies that will be made available to schools for purchase.